Green & White Sheer Cap-Sleeve Top & Camisole Only $7.99! This top is nothing but breezy! Get the Green & White Sheer Cap-Sleeve Top & Camisole for Only $7.99! Green piping livens up a sheer textured top featuring pretty cap sleeves and an empire-waistline. A solid-hue cami layers underneath for all-in-one style! Macy’s Shoe Sale Buy One Get One 50% Off! Now is the time to pick up some great summer shoes, during the Macy’s Great Shoe & Sandal Sale! 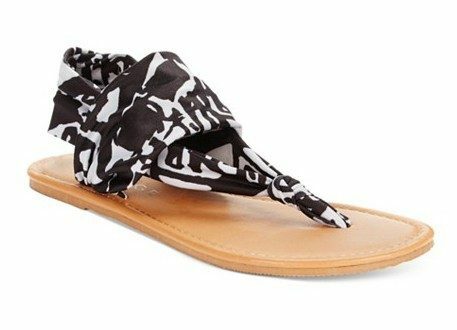 These Rampage Taxi Flat Thong Sandals are on sale for only $27.30! Marked down from $39 this is already a great price, but you can get another pair of equal or lesser price for half off! It’s like paying only $20.63 for this pair!